What if my boss is the monkey? I had an individual submit a question for me at a recent conference. 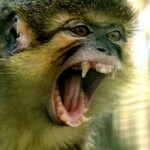 They wanted to know what could they do if their boss was the monkey…wow! That is a terrific question. My advice? Don’t assume they want to be viewed this way or that they even know you feel this about them. First, sit down and have an open conversation to see if you can get a feel for where they are coming from. Invite them to share a cup of coffee. Make sure you try to do it away from the unit and outside of any other business that needs to take place. Just start with some open-ended questions like “How are you? You must have a lot of stress in your position. Anyway I can help?” Then sit back and listen to what they have to say. It could be that this boss is under tremendous stress and doesn’t have any support systems to help them, leaving them to feel all alone. Perhaps that causes them to act inappropriately. If there is any possibility of changing the behavior, you will need to have some level of trust between the two of you or they will not be open to anything you have to offer. If you become convinced they are just a toxic person…then go ahead and politely let them know how they make you feel. Don’t speak for others. Present your feelings. Speak from your heart. Prepare yourself for backlash, but be willing to welcome them if they open up in an apologetic manner. Sometimes, it takes someone confronting you about inappropriate behavior to get you to change. Be willing to be that change agent. Good luck. I would love to hear how you make out.